Kölsch is a bit of an inbetweener. It’s an ale that thinks its a lager – or maybe that’s the other way around. Expect brilliant clarity, a golden colour and a creamy white head. So far so lager, right? But when you smell it you should find some fruitiness there. It’s brewed with an ale yeast and has the characteristic esters to match, albeit in a subtle way. You may pick up a little noble hop character on the aroma but it shouldn’t be too pronounced. Cologne has some serious brewing pedigree, with at least 1,000 years of brewing history to its name. But it has not always been exactly in step with the rest of the German brewing culture – while brewers elsewhere were experimenting with the new lager techniques, those in Cologne stuck to their guns using top-fermenting ale yeasts. Despite this, however, the Kölsch style is not as old as you might expect. Its history spans less than a hundred years, beginning in earnest in the mid-20th century. In 1986 twenty-four Cologne breweries formed the Kölsch Konvention. 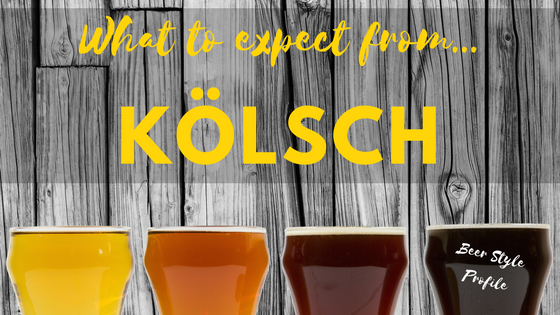 This association agreed certain standards for the style – namely that Kölsch should be pale in colour, filtered, top fermented, hop accentuated, and served in a stange glass. It also ensured the name could only be used to describe a beer brewed in Cologne.